Tilbury Juniors, Where are they now.? Putting names to faces is getting harder but these are the ones I think I can remember. Back row, Roy Harvey. Allen Appleford. Ray Benson. Kenny Lawson. Ian Taylor. Kieth Luck. Earnie Appleford. Middle row, Peter Gathercole. John Ryder. Tony Clark. Charlie Blake. Dave Peacock. Brian [Danky ] Barham. Graham Paisley. My dad is second from left top row, Alan Appleford and at the end of top row my grandad Ernie Appleford who managed the team. I cant remember what competition it was but I am sure they won a really important cup…. Its definitely not Stephen Harvey. He wasn’t born in 1964!!! nothing wrong with your memory Percy, nice to see you on here hope you and your family are well,Regards Andy. Yes of course I remember you and Messrs Penfold & Brooks. At one time Barry used to deliver our milk when we lived in the Railway Cottages, he was working for tha Co-op then. I also remember that super green shaft driven Sunbeam motorcycle you had and if I remember correctly you may have been guilty of riding it illegally once or twice. I can remember Dickie Penfold (aka Treadlight) and his brothers Teddy and Archie. 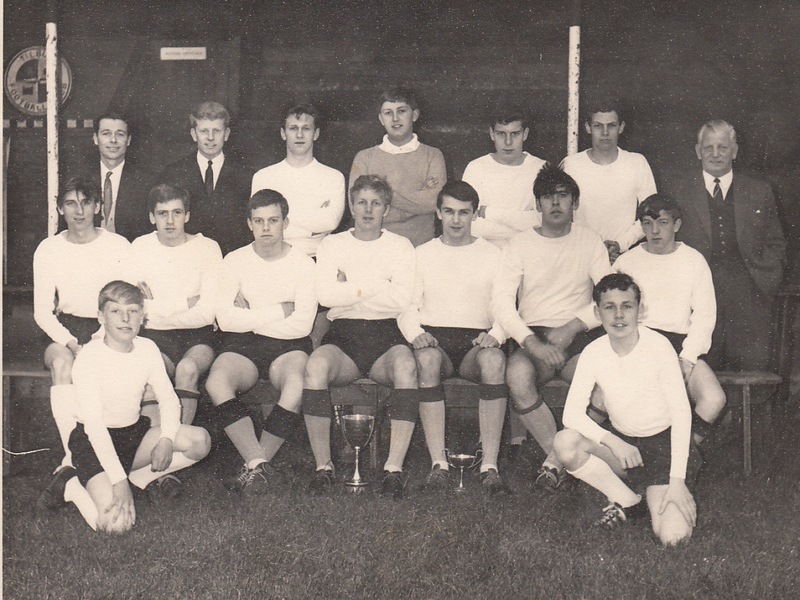 There is a photo of Archie in the same Railway football team as my Dad on this site. Note from administrator: E-mail address removed as we do not encourage posting e-mail addresses on this site. Get in touch with me if you wish to contact Percy Dalton. Mr. Ryder as I remember it Mr. Bareham’s christian name is Alfred! This photo brings back quite a lot of memories. It reminds me of the rivalry between St. Chads Youth Club and Tilbury Juniors. I remember other T.J. players Bennie Bennett, Johnny Suttling, Brian Herbert? We had equally good players at S.C. Dennis Mann, Alan Scruby, Colin Macabe to mention just a few. On a sadder note I believe Roy Harvey passed away recently, can anybody confirm this? hi keith good to hear from you I missed you by about a week! when you organized a reunion back in the late 80 s. was a good friend of brian sewell but have not seen him since 1976. I was told by his brother david that graham pasley had died in a car accident many years ago. will keep in touch on this site.it would be great to hear from the other lads. Have been looking for you for years you seemed to have vanished into thin air. Love to catch up with you, I regularly stay at Ampthill in Beds. when we return to visit the UK. Do you know where Brian Sewell is? The goalkeeper is me ken Lawson. After getting married and living in London for many years I am now retired and living in Bedfordshire. I remember before tilbury juniors formed having friendly games with john ryder pete gathercole roy bridgehouse jimmy Lawrence and others. Must have been about 1962. Great memories. Yes Charlie that is my brother and we were in Oz in November so not sure when we will be back. Perhaps we can meet again, when will you be in Australia next. Andy does that mean I looked 65 all those years ago. Sorry Charlie yes it is Paul Harvey on left and Steven Harvey on right but no relation. Sorry for the delay but in answer to Barry, yes that’s me and we did play there, in fact that was the beginning of Tilbury Juniors. you have hardly changed John. Thanks for the information,Front row on left I thought he was Paul Harvey whom I worked with at the London Graving Dock. Let me know if I am wrong. John Ryder how many years have past since we last met.Still have your wedding photo’s.That could be another topic. Tilbury weddings. Did you live in Brennan Road and is Freddy Ryder your brother ? If I am correct,when we were kids, then you, me, Paul Carter, Roy Bridgehouse, John Jerdan David Peacock, Ronnie and Steve Atkinson and others would have a kick about every Saturday and Sunday mornings on the “triangle” opposite your house. Just had another look,next to Keith Luck is Ian Taylor.